That camera you see above is the GoPro Hero4 Session, the fifth and newest member to the company’s current line-up. You can’t have avoided noticing that the Hero4 Session is a small black square, and not the traditional silver matchbox, or gray lump we’re used to. It’s the most striking update in design we’ve seen from GoPro for, well, ever. The smaller, lighter form factor is the most obvious talking point, but the feature set is interesting too, for a mix of reasons. Let’s start with what it can do. 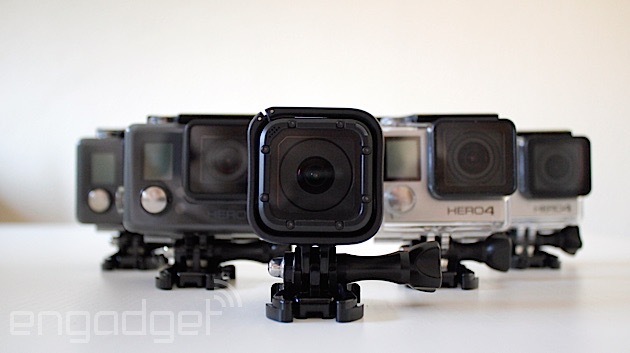 The Hero4 Session shoots video up to 1080p at 60 frames per second (fps). It also has many of the modes existing GoPro users will be accustomed to: 1440p (4:3) at 30 fps, 720p at 100 fps, 960p (4:3) and so on. The full list (there are many more variations) is not as exhaustive as the Hero4 Silver or Black, but all the most used slow-motion and 4:3 perspectives (good for point-of-view shots) are there. There is, of course, a notable absence of any 4K, or even 2.7K modes that we see on the Silver and Black edition Hero4 cameras. As for photos, the Session shoots in 8-megapixel wide-angle, or 5-megapixel medium, with time lapse and burst modes (up to 10 photos per second). With that new design, GoPro’s pulled off a bit of a magic trick. 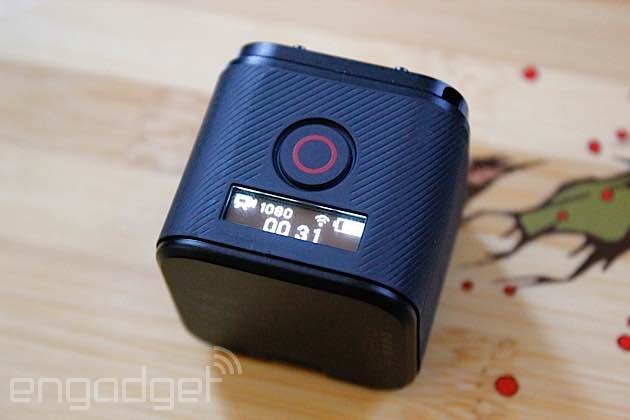 It’s about 50 percent smaller than a Hero4 Black in its waterproof housing, and around 40 percent lighter. The trick is that the Hero4 Session is submersible to 33 feet (10 meters) without needing a case. Inside that waterproof cube is a nonremovable battery, a microSD card slot and — hurrah — a micro-USB port (rather than GoPro’s traditional mini-USB). The Hero4 Session also introduces a dual microphone setup that auto switches between the two when one detects too much wind or noise, a first on any GoPro. This configuration also means audio shouldn’t be as muffled, which is often a problem when inside a case. The Hero4 Session’s not the first square camera, but as this patent reveals, GoPro’s been working on this design for some years now. 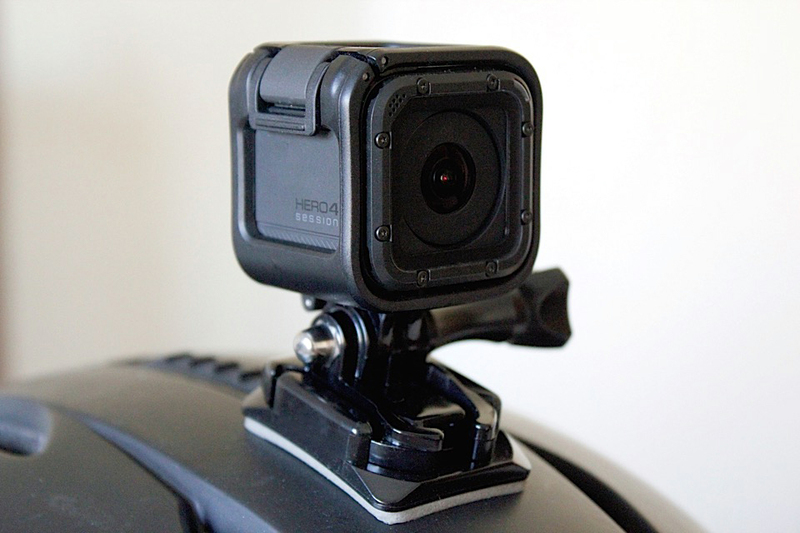 The smaller footprint isn’t just about reducing size and weight (though many will appreciate that); GoPro’s hoping it’ll open up new mount locations previously not possible. The Hero4 Session will get into nooks and crannies that other GoPros cannot; it also just makes it more manageable. There’s less drag or weight when mounting on things like helmets, paddles and, say, competitive road bikes. If you thought this would be ideal for quadcopters, it looks like there isn’t video out over USB, unlike other Hero4s, so that’s a bit of a showstopper for the RC crowd. What about those dreaded “can’ts?” We’ve already ticked off the biggest one — the lack of 4K/2.7K. It’s easy to malign its omission, but in boiling down the camera’s size, and keeping the battery life reasonable (we’re testing GoPro’s claimed two hours of use right now), large, power hungry image sensors will be something for a future model. There’s also, perhaps obviously, no touchscreen. We’d argue this is unlikely for future models either (though please, GoPro, surprise us). Another casualty of the diminutive design is the smaller front display, which is now a strip of basic info on top of the camera. This, in turn, changes the menu interface. If your fingers have finely tuned GoPro-button muscle memory, it’s no use here. Controls on the camera are extremely limited. You can start/stop recording or take photos, tag highlights and put the camera into wireless (Bluetooth and WiFi) connectivity mode. All this to say, with the Hero4 Session, you will be getting very familiar with GoPro’s mobile app, or a remote control (not included), as that’s your only way to switch up the video mode or photo settings. If you’ve used any of the company’s cameras for more than five minutes, you’ll have experienced the “GoPro slouch” — the position you adopt as you navigate the menus, picking what you think/hope is the best mode for whatever you’re about to do. It’s this condition that the Hero4 Session is, in part, designed to eliminate. One press switches the Session on, and starts filming. Press it again and it’ll stop/switch off. If it’s photos you want, it’s the same; just press for three seconds the first time. You can set the default settings for either via the app. By keeping options simple (rather than limited, like the entry-level Hero), the idea is you just mount the camera and go. In our early testing, it takes a little getting used to, but some will likely appreciate the set-and-go format. This mixture of simple interface, yet semi-advanced features (Protune, for example, remains, even if total video modes are reduced) makes the Hero4 Session something of a dichotomy. I asked a representative if it was a Hero+ LCD in a smaller box and was assured that the Session’s components are definitely more in line with the Silver or Black. Then there’s the price. At $399 (£329), it’s the same price as the Silver, which has many features the Session does not (such as a touchscreen and higher-resolution recording — 2.7K/basic 4K). GoPro’s banking on there being enough people that want more video modes than the Hero+ LCD ($299) and/or that love the low-profile design. But for many, this might feel like a tough sell. What really seems to be going on is that the Hero4 Session is an exercise in engineering. It’s small, with smart features like the dual-mic setup, which we’ll likely see trickle up to future flagships. Not least if you were hoping for a touchscreen on the next Black, there’s every reason to suspect that space isn’t an issue. There are also new pack-in mounts (including a new ball-joint quick release which is a game changer), so in many ways, the Hero4 Session feels like the most refined GoPro yet. In short, the niche it fills means the Hero4 Session will either really call out to you, and solve a problem, or it might not make all that much sense right now. If you fall into the latter camp, GoPro does have another four cameras it will happily sell you instead, after all. There’s no doubt, this would be an easier sell if 4K was in the mix, but something tells me that’s already in the works. The Hero4 Session is available starting July 12th.